A celebration of life for longtime friend, poker buddy and fellow REALTOR. 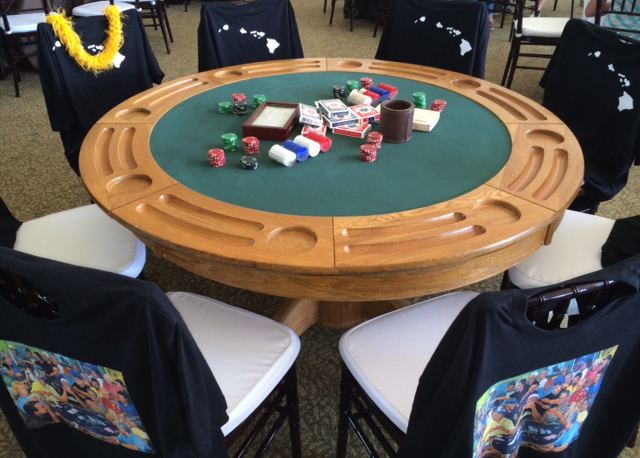 The poker table set up in memory of Jim. 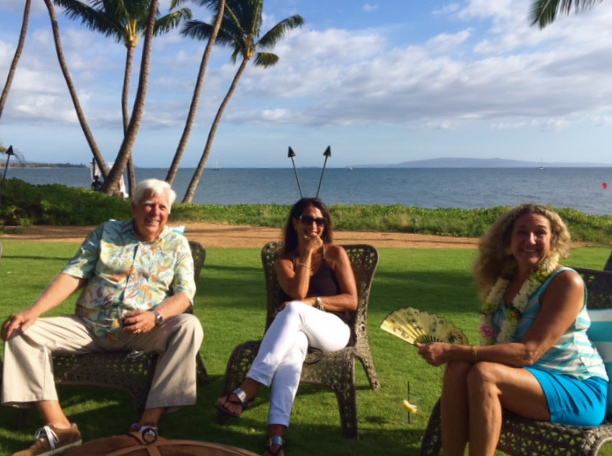 A number of friends gathered at Don Nelson‘s property, on Sugar Beach in South Maui, to celebrate the life of Jim Sanders, truly a unique and inspirational guy. 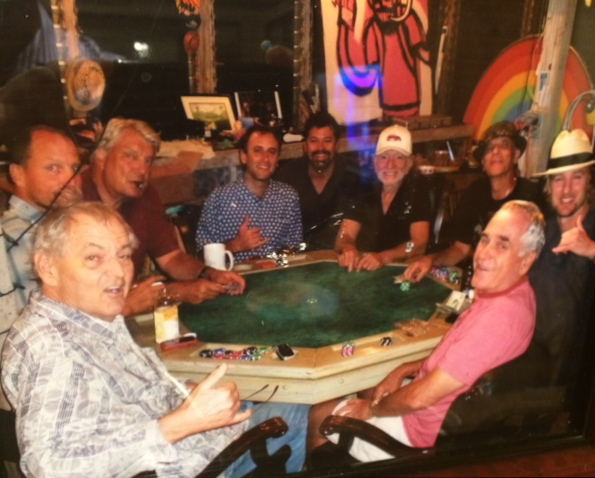 One of Jim’s favorite hobbies was playing poker, and he is featured prominently in a painting commissioned by the former NBA coach, called Nellie’s Poker Room. This painting was displayed front and center for everyone to see upon arrival at the property, and there was even a poker table set up (complete with chips and cards) in the middle of the room, which had that painting on the back of black shirts. Some our favorite games were played at Django’s lounge, and Jim would always sit to the right of Willie. In his honor, during our most recent games, we left that seat vacant for him. We all have numerous memories of him from those games— he was quick witted and a great story/joke teller. It was also crystal clear that he had lived a very interesting life, traveling worldwide and doing all these spectacular things. Certainly we’ll never forget Jim, and will continue to honor and celebrate his life the best way we know how! A fair amount of people in attendance were his poker buddies. This included restauranteurs Joe Gannon, of Hali’imaile General Store and Gannon’s, and Roy Dunn, owner of Koho’s in Kahului and the Beach House on Kauai. Additional attendees were Ben Holtz, as well as musicians Willie Nelson, Eric Gilliom, Duffy Herman, Donny Divino Smith and his wife Sada. 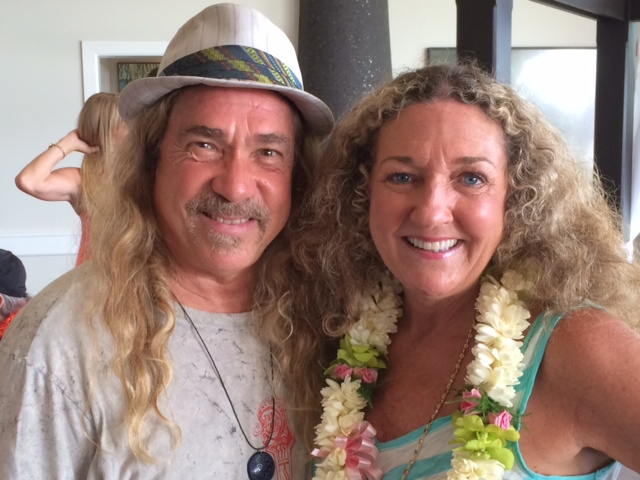 There was also Dr. Deborah Mathias and husband Dave Niehaus, Dan Goodfellow, VP of Goodfellow Bros., Kenny Rothman, founder and Principal Broker of Ka’anapali Properties, and Shep Gordon, Maui’s favorite Hollywood insider and star of the recent movie, Supermensch: The Legend of Shep Gordon. It was really an eclectic group of people coming together. Always good to see Dan Goodfellow, VP of Goodfellow Bros.
Shep told a wonderful story about Jim coming over to his house for a party, where there would be people from all over the world. Yet, no matter how obscure their hometown was, Jim would usually have some reference of those various places, that’s just how well-traveled he was! 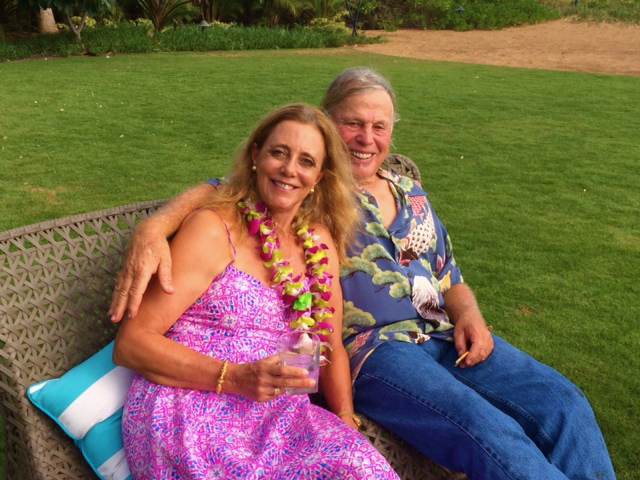 Jim was broker/owner of his own company, Jim Sanders Realty, that was located in Paia for quite sometime before relocating to Kahului. 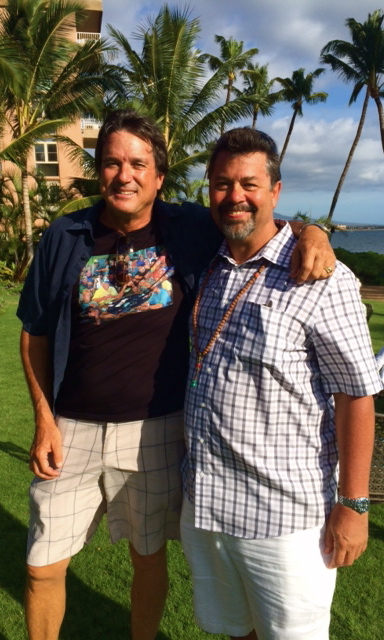 He got licensed from RAM in 1987, and we actually did a couple deals together in Kilohana Ridge with Don Nelson in the early 2000s—so he was somebody I’ve known in the business for quite some time. Someone who worked for Jim, Kimberly Wendt-Gonsalves, joined his team right out of high school, and was with him for 17 years. When Jim was winding down his practice, I called him to talk story and ask about Kim, whom I was considering for the position of client care coordinator for our team. 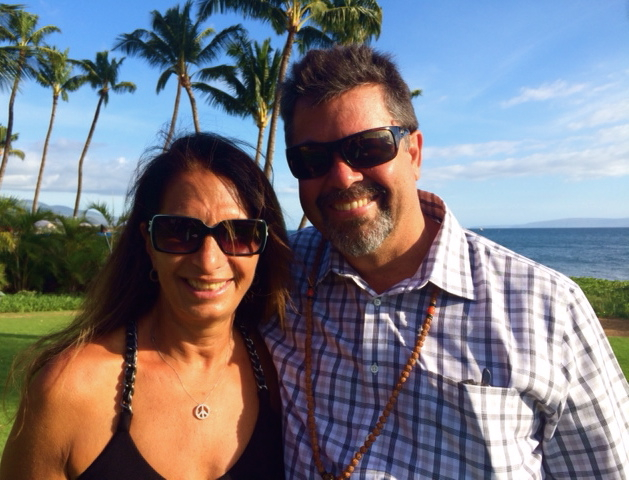 Jim only offered the highest recomendation, and when I made it clear she was the perfect candidate, it made him very happy to know that she was joining our ‘ohana. Jim was a big lover of the arts and quite philanthropic. Everywhere he lived, there would be tons of art on his walls acquired from the numerous silent auctions he attended, including some from a Maui-based artist and friend, Ed Lane (who was also there). 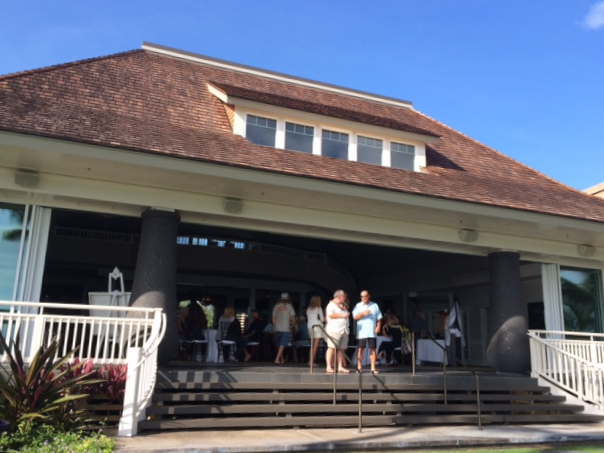 Jim and Don Nelson used to put on the Make A Wish Fundraiser for the Children’s Miracle Network out in Waikapu at the Marilyn Monroe House, now the clubhouse at the King Kamehameha Golf Course. He was also a big supporter of the Maui Arts and Cultural Center, and you would always see him sitting in in the front row for at live performances. At the 25th Annual Farm Aid that Willie Nelson was co-hosting in Milwauke Wisconsin, we met up and hung out in the duggout with Norah Jones and good friind, Mudslide, another Maui artist. Jim was also a big contributor to Mana’o Radio (91.7 FM), and even commisioned the online station so it could be streamed around the globe. This is just another shining example of his philanthropic nature and selfless contribution to our island. It was a lovely afternoon celebrating the life of a special man. Everyone was amazed at the diverse turnout of Maui residents, which just goes to show how much he meant and was loved by the community. We miss you Jim!